Members of PESTILENCE have come and gone. There has been one constant figure throughout, Patrick Mameli. The man is the heart and driving force of the legendary Netherlands death metal band. The ensemble has undergone periods of inactivity, and nonexistence, including a span that lasted 14 years following the promotional cycle of the group's groundbreaking fourth album, 1993's "Spheres". What appeared to be the band's swan song, and essentially was for many years, was rich with experimental and prog tendencies that benefited from the employment of guitar synthesizers and touches of jazz. At that time, the metal world wasn't as accepting of an album that is now revered as a foundational cornerstone of all that is progressive death metal. In 2014, following the unit's vitriolic release "Obsideo" from the previous year, few expected the band to disband, but it happened once again. Mameli's NEUROMORPH project proved to be ill-fated, and in spite of the ongoing volatility, he reformed PESTILENCE, yet again, just two years after the second breakup. In the face of it all, Mameli remains resilient with PESTILENCE's latest offering: b>"Hadeon". Mameli has once again revamped his lineup for its eighth album. Joined by drummer Septimiu Hărşan, bassist Tilen Hudrap and guitarist Calin Paraschiv, PESTILENCE has released one of the year's most impressive and distinct extreme metal albums. Following an intro, Mameli and company get right to business with "Non Physical Existent". After a punchy drum fill, followed by an equally mood-setting ascending riff, a nose-to-the-grindstone, ripping thrash riff is unleashed and is perfectly representative of the act's vicious death thrash capabilities. This is but one of several examples showing how Mameli and company have rekindled the flame of early PESTILENCE from "Malleus Maleficarum" through to the classic "Testimony of the Ancients". "Multi Dimensional", too, bookends an instantly infectious catchy riff, one of the album's best, with raging quick-picking guitar work on either side. PESTILENCE bridges the gap between that initial, primarily aggressive era with the following experimental period for which the groups is equally known on tracks like "Oversoul", fluctuates between speed-driven guitar work and off-kilter riffing with jazz-like qualities that are nestled within an ominous atmosphere not far removed in spirit of that pivotal album "Spheres". Seemingly simple tactics to spice things up actually significantly provide contrast and differentiate the songs from one another. On "Manifestations", for instance, a menacing bass line is quickly layered with a jagged riff that together merge into a steamrolling, simple but testosterone-stoking riff. Elsewhere, the sporadic use of robotic sounding vocal effects on songs like "Astral Projection" add an interesting, futuristic dynamic that's almost filmic. Nowadays, the technical and progressive strands of death metal, that PESTILENCE helped establish in the first place, are ubiquitous and flourishing. Ironically enough, Mameli and company have arguably returned to their death thrashing roots in a pronounced way. Yet there's no doubt that they've not betrayed their passions for odd-timed complexity and experimental expression. 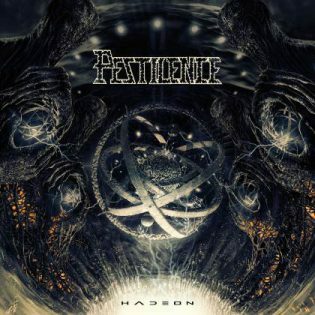 With "Haedon", PESTILENCE wrote memorable, aggressive songs that are spiced with dashes of avant-garde, forward thinking that is anything but run of the mill.